Pert-time, we mean, Part-time flexible work… Are you Buff enough…? The hunt for Buff men hits Canada’s headlines! We’ve had an overwhelming response for the hunt for a ‘few good men’ to apply to become Butlers in the Buff thanks to the help from the world’s press highlighting the job vacancies we have and the ‘impeccable’ recruitment criteria we have. 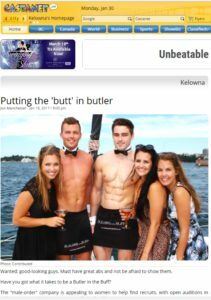 In January, the news broke that we are recruiting across Canada and, in fact, across the world, with Butlers in the Buff job vacancies in all parts of the UK, USA and Australia. We received some fantastic press coverage about our search for the world’s hottest men! Here at Butlers in the Buff we take recruitment very seriously. Our standards of Butler are very high so finding lots of the perfect men to make the grade as a Butler in the Buff is no mean feat. Of course, our butlers must be muscular, good looking but they also have to have great personalities who can mingle with guests of all ages and backgrounds. The butlers must also be lots of fun, charming, polite and not to mention super-hot! Yet not sleazy, womanizing or too into their own appearance! They also must be happy to serve drinks and play party games at hen / bachelorettes, birthday parties, charity events, corporate events and just for the hell of it parties, all whilst wearing, well, not very much! Finding enough Mr ‘Right’ is very hard and makes our life at Butlers in the Buff HQ a little tricky. But thanks to some great media coverage we are getting hundreds of charming buff men apply for this role, which has to be said must be the best part time job in the world! So we have lots of lovely butlers to serve you lovely lot throughout 2017 and beyond!